Are you wondering how to organize all of your math materials? Between the piles of manipulatives, centers, and possibly text books, it can be an overwhelming task. 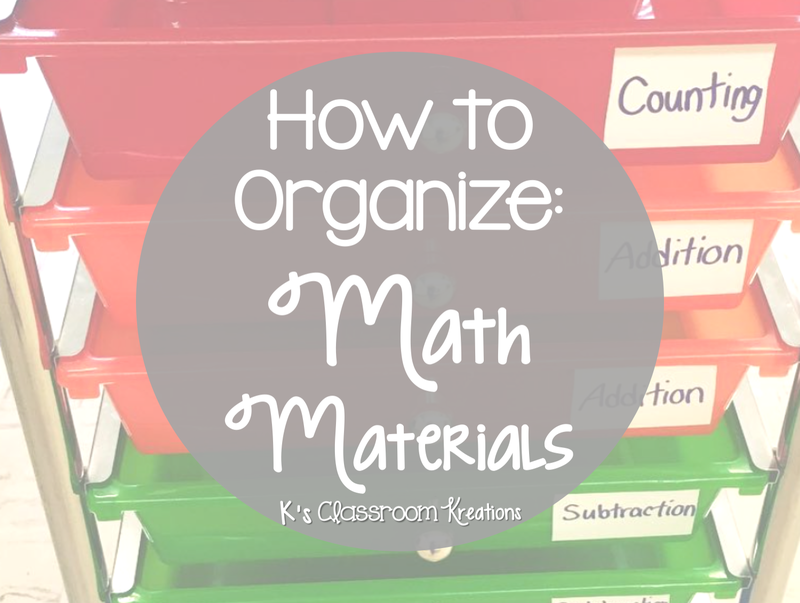 Today I'm going to break down my process for you and share how I organize my materials and prepare for the year. 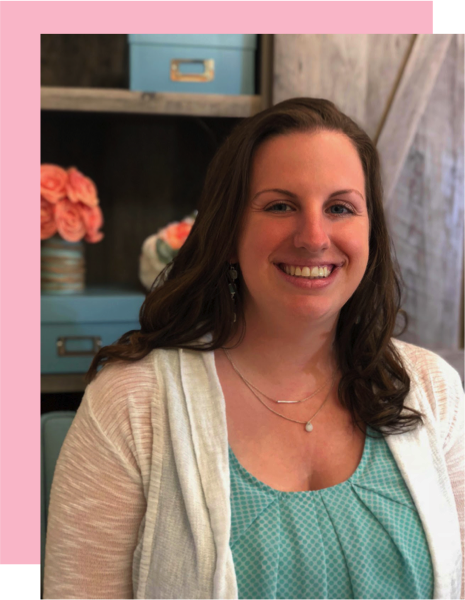 This post was originally part of my Math Tip Monday series with my sweet friend Theresa from Theresa's Teaching Tidbits. First comes the unpacking process. I always have such great intentions to organize at the end of the school year but somehow energy brainpower time always seems to get away from me. 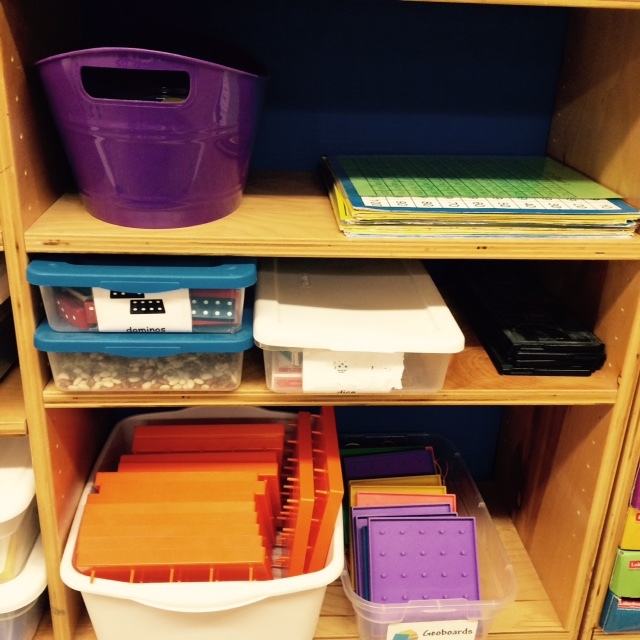 I start my year by putting all of my math materials in one area. Please note- these pictures are coming to you live, straight from the mess of my room and are not quite the picture perfect classroom images I dream about sharing, but let's be real....unpacking always gets worse before it gets better! I like to have one area with all of my math materials for easy access. I also like to label each item so my students can get what they need, and hopefully put things away. (I'm in the process of updating labels and will reveal the final look during my classroom tour in a few weeks). 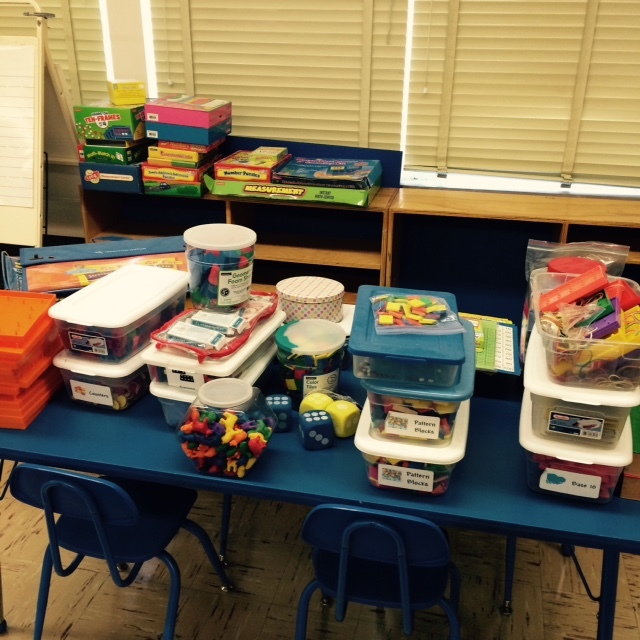 Next to my materials (manipulatives, 120 chart, math games, dice, etc.) I have a rolly cart for math centers. I find myself teaching a brief whole group lesson and then doing guided practice. Typically this means that my students are using white boards to apply the skill or playing a partner game while I monitor. Next comes my "weeding out" process. 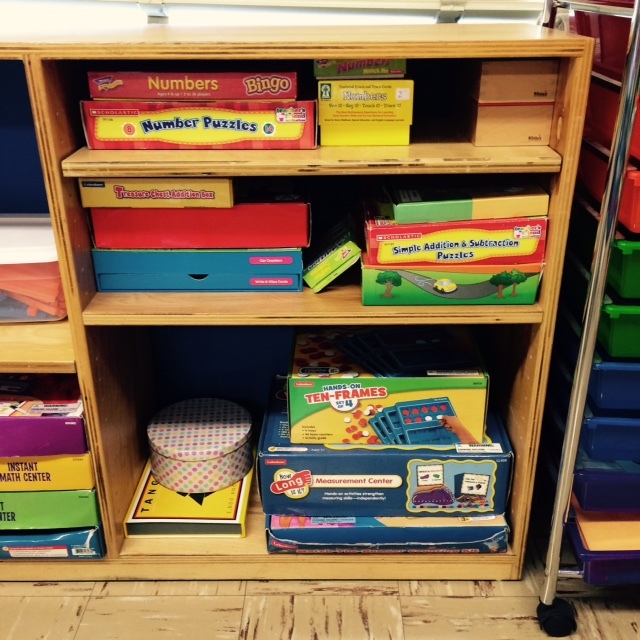 Once a child shows mastery I send them to the rolly cart to get a math center of their choice. I like to keep a combination of centers that focus on our current standard and also spiral back to previously taught skills. I also recently added dry erase tape to my drawers so I can label the skills easier. My kiddos have free range of where to sit and work in the classroom as long as they are on task. I send children off to centers until I am left with the few children who need additional support. This process works well for me because I can instantly provide support for those who need it while my remaining students are engaged elsewhere. Also, this form of flexible grouping ensures that kids get support when they need it, on skills they need help with. Everyone has strengths and weaknesses and I don't want to formally group students for math because their proficiency changes so frequently. 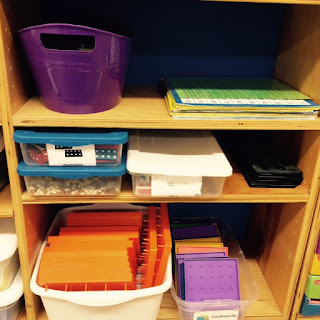 In order to keep up with all of my centers I create storage boxes by standard. I bought my boxes from Walmart a few years ago but if you are looking for something sturdier, I love these boxes from Amazon that have handles. 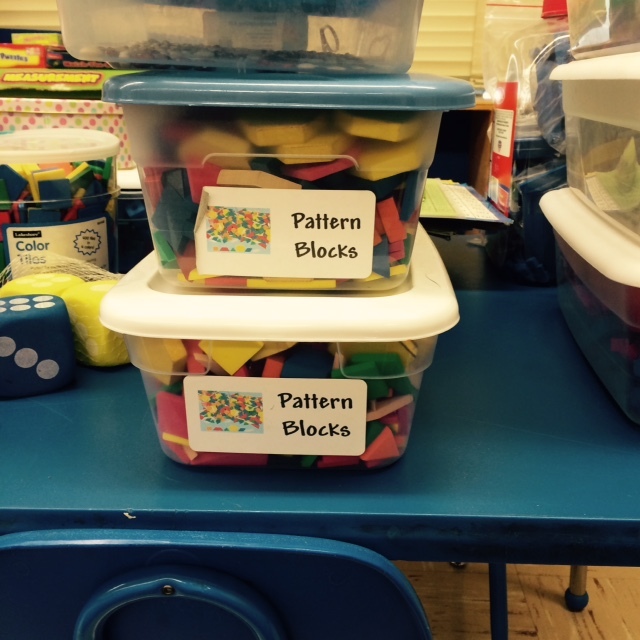 I then stick a bright colored label with the Common Core standard to each center baggie and place it inside. What can I say, I like color coding ;) When you use Avery labels, you can use their online design studio to type up your standards or wording. It is so simple. Promise! 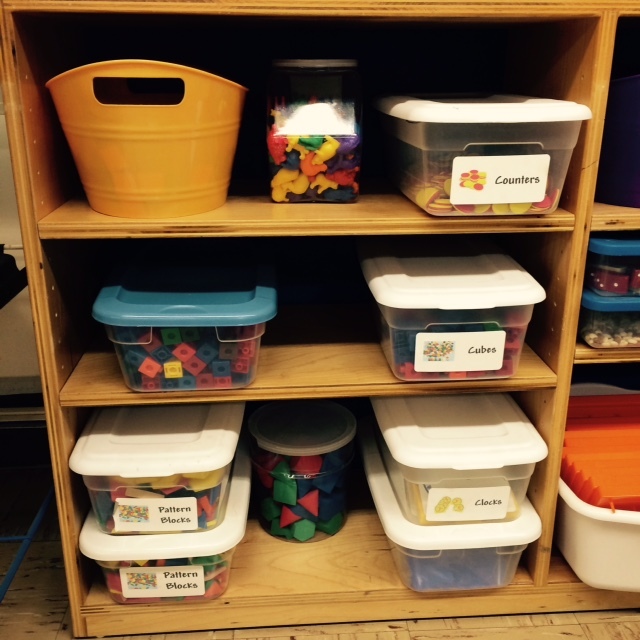 I keep mainly just year round centers in these math bins. I have separate cardboard banker boxes for seasonal items like manipulatives, holiday math centers, etc. It's just easier for me to take one box out at a time and not have everything mixed up, especially for skills like addition and subtraction that we work on all year. I used to just write on the side of the boxes, which totally works fine! But, if you want a simple fix you can staple a plastic sheet protector to the outside of the box and slide in your label. Covers up the old mess and looks cute! And my final secret....HIDE THE MESS! ;) We don't use text books anymore but of course they have to stay in our room. The clutter was getting to me and I didn't want to make space down low where we work each day if the items were never used. I stapled a large piece of fabric to a strip of wood and balanced it on top of the boxes. So simple! Plus, you can choose any fabric that matches your decor. 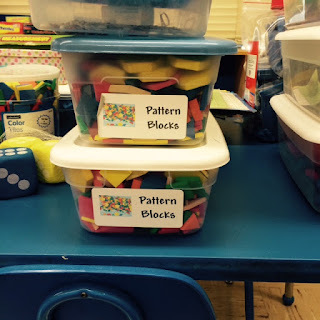 How do you organize math centers in your room? If you are interested in the actual math centers that I use each month, here is a collection of many of them. Enjoy! 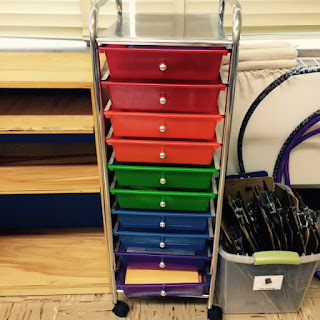 Love the organization ideas! Thank you for posting this. Thanks for getting us organized! See you next month. Love your organization and listing the standards with the lesson that go with it! I love your organization ideas! I really love how you organize by standard, that will make it so much easier! This sounds like a great system! I will have to try it out this year. Thanks for the great idea!